↑ Statute of the International Court of Justice ওয়েব্যাক মেশিনে আর্কাইভকৃত ২৯ জুন ২০১১ তারিখে. Retrieved 31 August 2007. 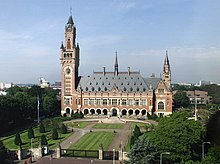 ↑ This occurred in the Legality of the Use by a State of Nuclear Weapons in Armed Conflict (Opinion requested by WHO),  ICJ Reports 66.